PITTSBURGH—Until now, comparing stress levels in individuals across the United States over time was not possible due to a lack of historical data that tracks stress using accepted comparable measures. New research from Carnegie Mellon University’s Sheldon Cohen and Denise Janicki-Deverts used telephone survey data from 1983 that polled 2,387 U.S. residents over the age of 18 and online surveys from 2006 and 2009 that polled 2,000 American adults each. 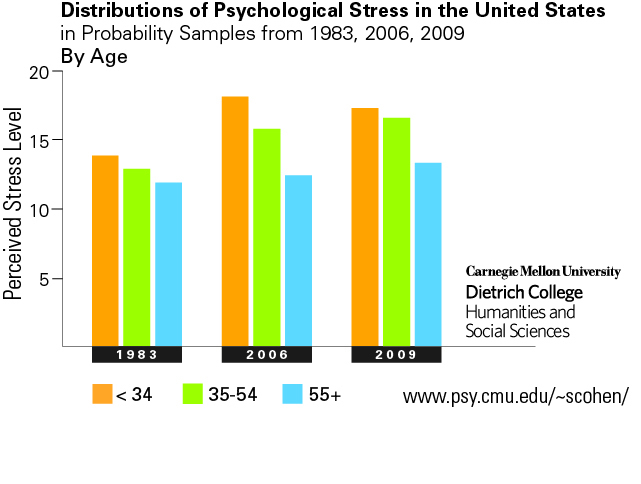 All three surveys used the Perceived Stress Scale (PSS), a measure created by Cohen to assess the degree to which situations in life are perceived as stressful. 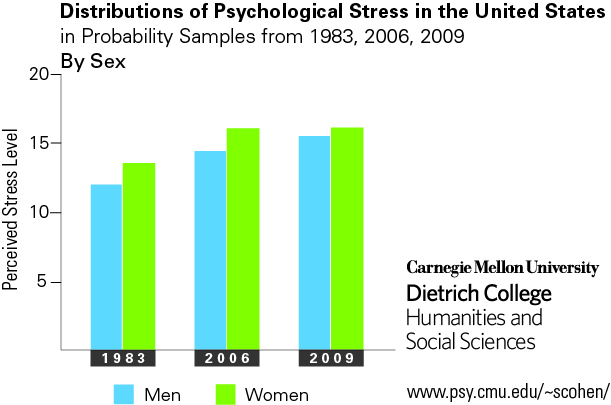 Cohen and Janicki-Deverts used the respondents’ answers to determine if psychological stress is associated with gender, age, education, income, employment status and/or race and ethnicity, and if the distributions of stress across demographics were constant over the 26-year period. Published in the Journal of Applied Social Psychology, the results show that women, individuals with lower income and those with less education reported more stress in all three surveys. They also show that as Americans age, they experience less stress and that retirees consistently report low levels of stress, indicating that retirement is not experienced as an adverse event. Using the 2006 and 2009 surveys, Cohen and Janicki-Deverts found that those most negatively affected by the 2008-09 economic downturn were white, middle-aged men with college educations and full-time jobs. The authors suggested that this group may have had the most to lose since both their jobs and their savings were at risk. Their results also showed between a 10 and 30 percent increase in stress in all the demographic categories over the 26 years between 1983 and 2009, however Cohen cautions against drawing the conclusion that Americans are more stressed today.